Where Can I Prospect? How to Find Areas to Mine for Gold. 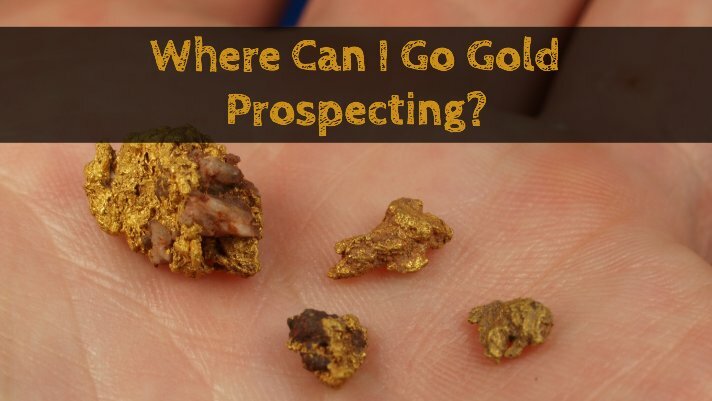 Home > Where Can I Go Prospecting? The most commonly asked question among beginning gold prospectors is generally along the lines of “Where can I go prospecting?” Our state-by-state guide is a great resource to get you started looking in the right general area, as it is very important to focus on areas that have produced gold in the past. However, once a general area is identified, finding a specific area can sometimes be a serious challenge. The two most common barriers that most prospectors will encounter are private lands and mining claims. In some mining districts, finding an area that is open to legally prospect can be quite challenging. There are a few options that new prospectors can take to gain access to gold bearing ground. The first thing that I would recommend is joining a gold mining club. The best known mining club is the Gold Prospectors Association of America. The GPAA has chapters in almost every state, and the benefit of joining is that you will have access to mining claims that they hold throughout the U.S. Most states have at least a few other local clubs as well, most of which have a handful of claims that members can prospect on. Joining a club allows any prospector to be able to work private claims for a very reasonable cost, and is highly recommended for beginners. Another option that surprisingly few people seem to consider is simply finding the owners (of either private land or mining claims) and asking their permission to prospect. Often private landowners own land that has gold, but the landowners themselves are not miners and have no interest in gold prospecting. Simply ask permission to prospect on their property and you may get a simple “yes”. You can also come to an agreement to share a percentage of profits from the gold recovered with the landowner. Asking permission from a claim holder is also a simple option that may pay off. Of course not all claim holders are going to allow others to prospect on their claims, but you don’t know until you ask. 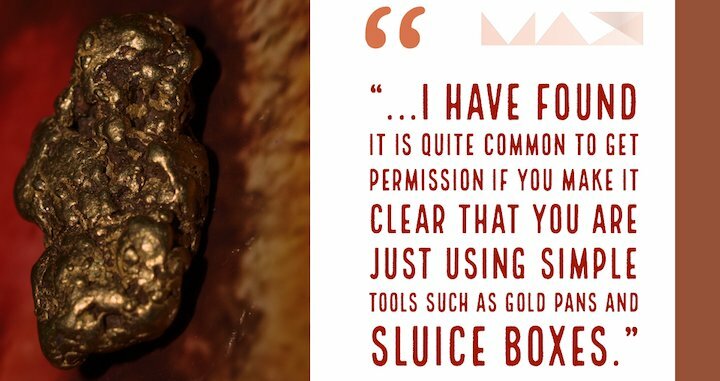 I have found it is quite common to get permission if you make it clear that you are just using simple tools such as gold pans and sluice boxes . Realistically, a person using small scale mining equipment are not going to have a serious impact, and many claim holders will have no problem giving you permission to do a bit of “pick and pan” prospecting for the weekend. You may also come up with an agreement to share a percentage of the finds, as discussed in the previous paragraph. Finally, it should be emphasized that not ALL of gold bearing ground is claimed. Certainly in some of the more populated and well known mining districts it can be hard to find areas that are not claimed, but I assure you that it is still possible to find areas on public lands that are unclaimed and open to prospecting. Doing the proper research will help you find these areas. 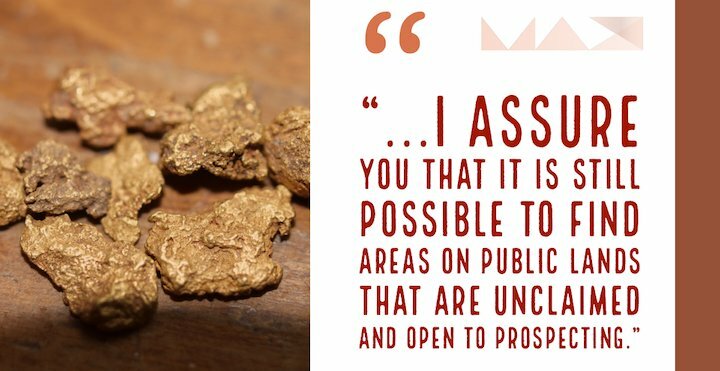 Yes, most of the well-known gold areas are claimed, but don’t ever believe the statements that all of the good gold ground is claimed up. Plenty of gold can still be recovered in relatively unknown areas, often on the fringes of the better known gold districts. They call it prospecting for a reason, so get out your gold pan and shovel and start searching!